All packed using travel cubes to help pack clothes. I was going to bring my big camera, but decided to upgrade to the 64GB iPhone8 to give me more room to capture video and take not to bad pictures of the trip. Therefore, didn’t bring too much. Small backpack I got from work as my personal item on the plane and daypack when I would travel to Italy after the work part of the trip. My weekender bag I would use to bring some work clothes and leave in Frankfurt when I sneak off to Italy and use as a checked bag to transport my bottle of Lufthansa Cocktail back to Toronto. Was excited to fly on the Boeing 747-400, since it would be my first time on this plane. After getting checked in and boarded in the two seaters at the back that gives you a gap between the wall and the seat to tuck you legs seen above and also your personal item. A work peep was also on the flight and she was sitting in front of me on the flight. After pushback we were waiting for a while. The captain came on the intercom and announced that when starting the engines they were getting a error message in one of the engines and they were going to move the plane around to the side of the airport and see if they can fix it by changing a fuse. After doing that they didn’t get success so they decided to pull out all the fuses and wash them and dry them to see if that would help. Still no luck. The captain said they would replace a control board to see if that would fix the error message. 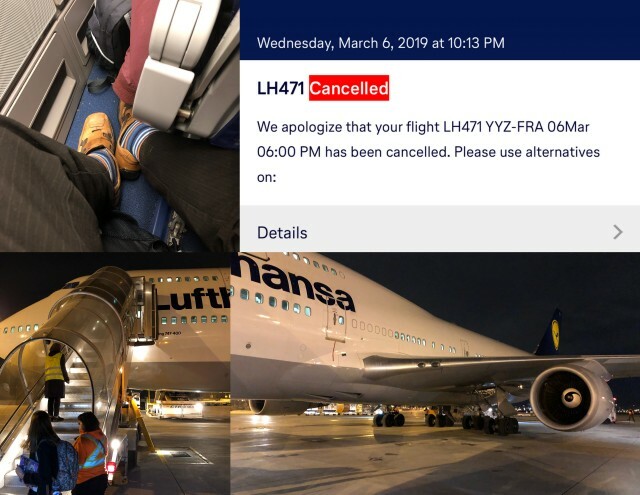 On the third hour being on the plane they had no choice but to cancel it. We boarded around 6pm and this was about 9pm. We waited for a bus to come to the plane so we can take a bus back to the terminal and go through customs and states we really didn’t leave the country. 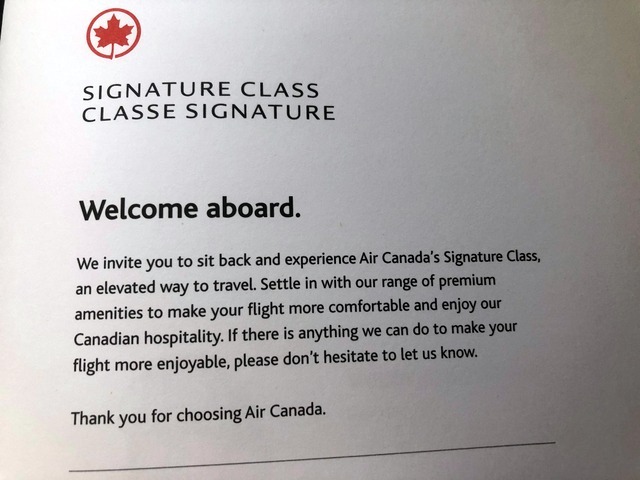 After that we were told to go down to the area at Pearson where you get shuttles to hotels and we would be sent to a hotel with hotel vouchers and food vouchers. Day two of the trip was in TorontoFURT. Kind of sucked but you take the time and shift it into a positive so I used the time to edit the vlog I was capturing with my phone and I also did some trip planning. My work peep was downstairs and we had $20CAD food voucher for breakfast and one for lunch to use so I went downstairs to the hotel’s Fiona McCools and noticed breakfast was $8.95… so I used my voucher to order two of them and made it into a 4 egg + 4 links breakfast. Why not. Madeline was my new best friend now and both our goals was to get to Germany early to goof around before the conference starts on the Monday. 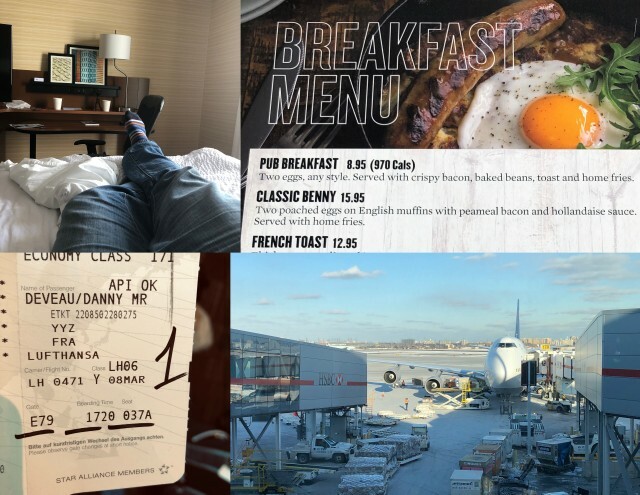 Today was Thursday and we both had confirmed space for Friday… so after having lunch together at the Hotel Pub (Lamb Burger which was really sweet) we headed back to the airport to see if we both would squeeze onto the plane. With the flight cancellation the night before some passengers were put on this plane so it was full and over by 7 people. We took the free hotel shuttle anyways and went to try. We didn’t fit so we called our contact at the company that helped us the night before and they set us up in a different hotel and we took a free shuttle to meet them there and they checked us in and gave us some more food vouchers for dinner and lunch the next day since breakfast was free at the hotel. The video below is us giving it another try. 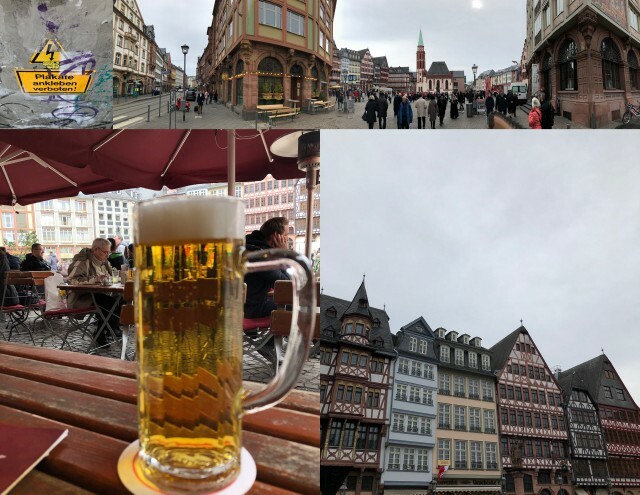 After touching down in Frankfurt… I checked into my hotel and decided to head down to the old city center square and grab a bite to eat and learn my directions around the city centre. A little 4 hour walk around… I was ready for a nap since I was up for more than 24 hours straight. I went back to shower and have a little two hour nap and about 9pm… I ventured out again till about 11:30pm and puttered editing a video before going to bed. The next morning, I had to make my way to Seeheim and check out the Conference Hotel and settle in a day early before the conference started. 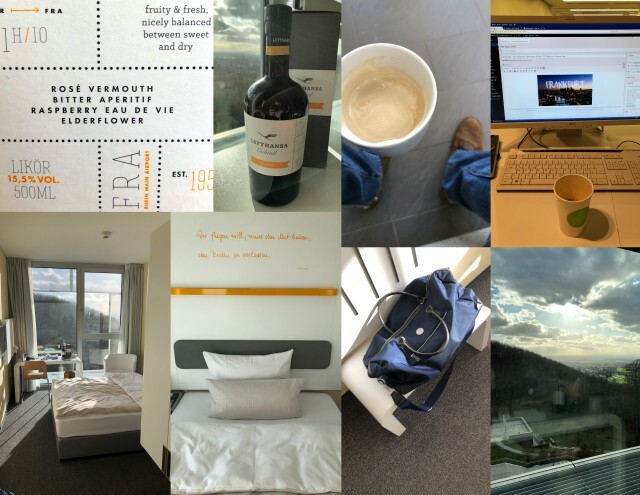 After having breakfast with a little sleep-in… I went to the airport to catch the company bus to the Lufthansa Seeheim Hotel & Conference Center. As you can see in the video… I missed that bus by minutes and then took a train to the hotel where I checked and ventured around the property checking it out. My Canadian work peeps were there and some were arriving later in the day. My room was simple and sweet and I had a nice view out the window. 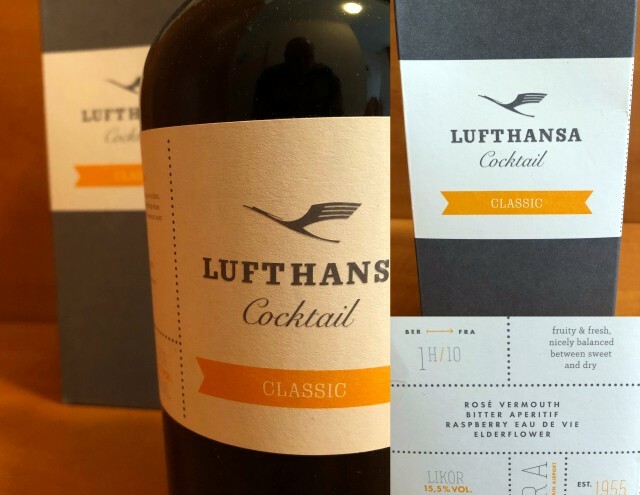 Each night… I poured myself a glass of Lufthansa Cocktail that they used to serve in the 50’s in first class. I was a bit of a night owl making coffee at 3am while doing laundry and logging into the computers you can use to check email, etc. As you can see from the videos the work part of the trip was jammed pack with seminars & workshops. Sitting down over breakfast, lunch and dinner with peeps from work was nice to get to know them better and it was also fun to get to know more people from other parts of the world like Innsbruck, Cape Town and Bruno. Some mingling activities with drinks was nice in the evening. 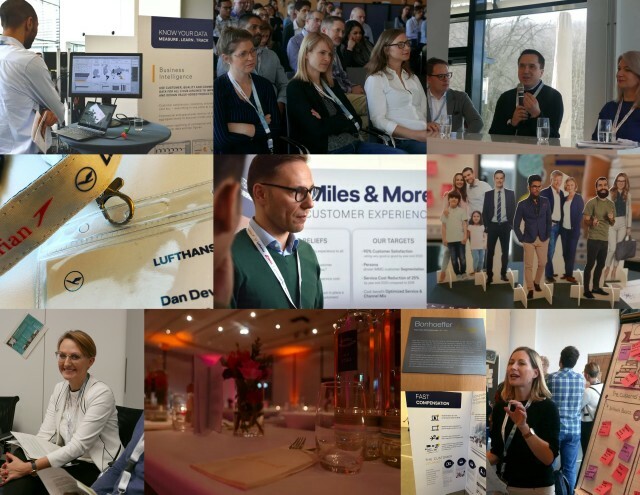 It was exciting to see all the things behinds the scenes about making the LH Group of Airlines as one in terms of Customer Service and the work involved to streamline processes as well make it easier experience to fly with us for passengers and how we deal with them throughout the entire process from start to during to post travel. 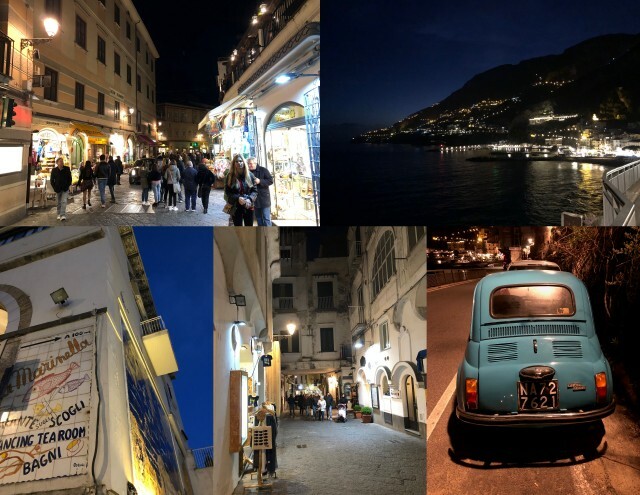 The next post will shift with moving along to visiting Naples as the gateway to the Amalfi Coast and into Italy before returning to back to Canada. Town, Manilla and other parts of Europe… the my fellow Canadian peeps stayed at hotel just south of Seeheim and we all took the 35min train north and into Frankfurt for a group dinner and a little bit of shopping. Thursday morning we all departed and most people went back to Canada. 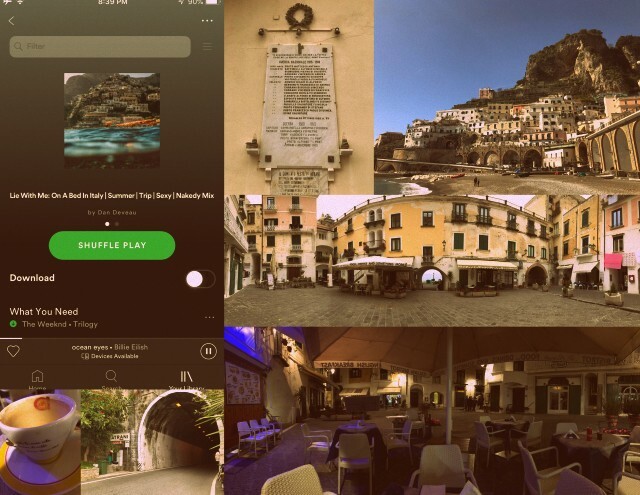 I decided to use my weekend and 3 vacation days to zip over to Italy since this summer I plan to return with the kids. A work peep who was heading to Italy too joined me on the flight to Naples. 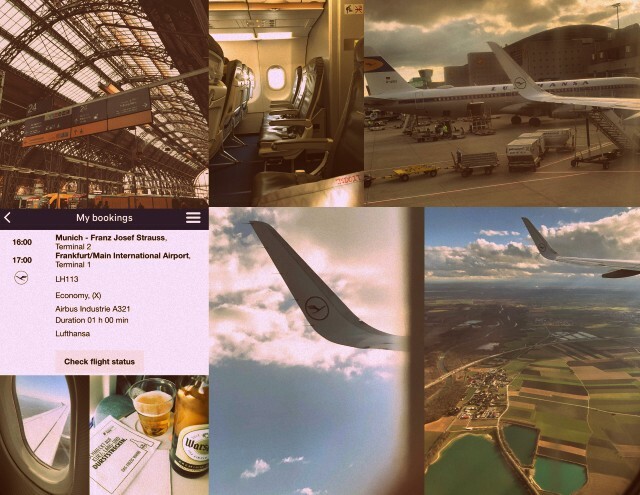 We took a taxi to the Frankfurt airport to catch our flight. 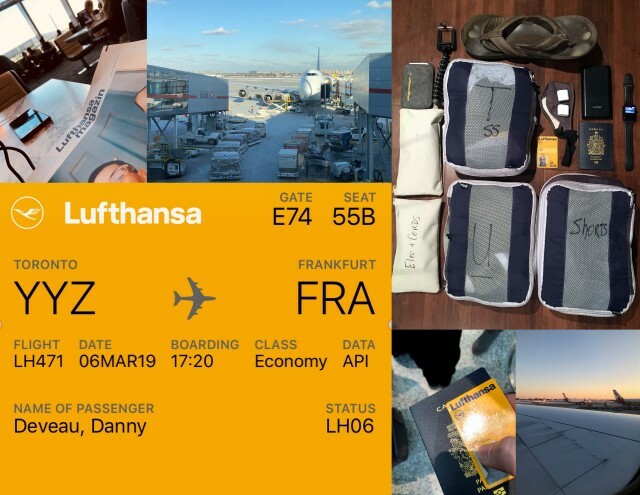 I only brought a small backpack for this trip and I stored my Lufthansa Weekender Bag at the Airport with my work clothes for 8 euros a day to pack light. 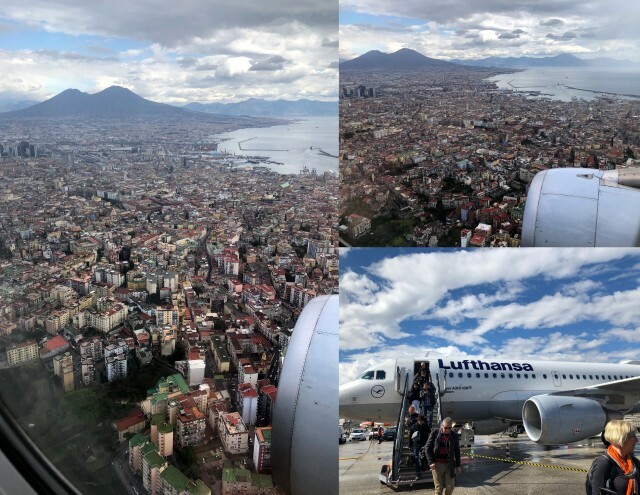 Flying into Naples felt like flying into Mexico looking at all the houses built up and packed close together. Palm trees when you walk out of the airport to grab a easy bus downtown to get to the main train station to grab a subway to my hostel I picked up on Hostelworld for $30CAD which was lovely. 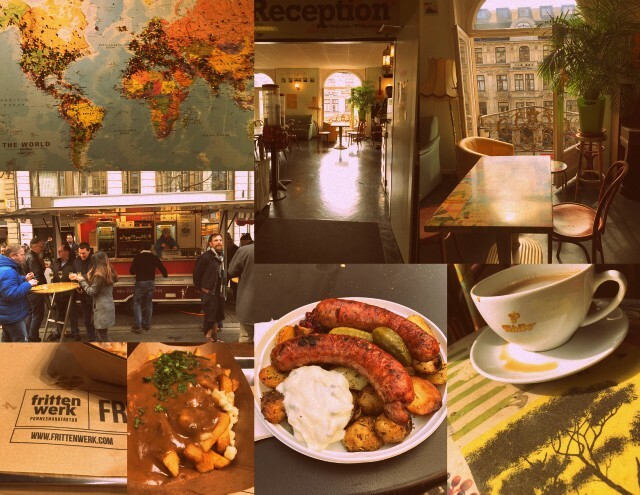 My hostel was a 100 meter walk from Salvator Rosa subway station. My hostel was La Controra. After checking in walked down to the old part of the city to walk around and soak in the city a little and grab a bite to eat. 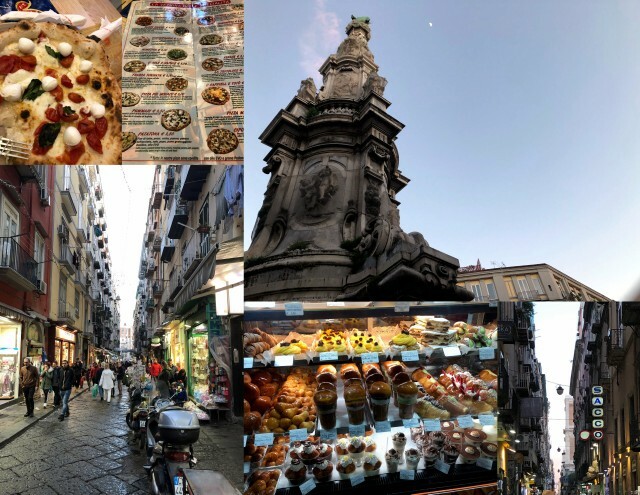 Along the way I stumbled into a great little italian pastry shop and picked up a selection of treats to try. So yummy! 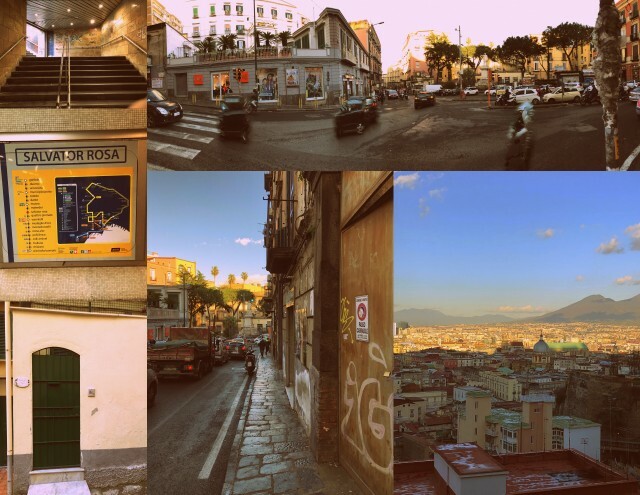 In the skinny streets packed with tourists and locals it’s neat how you can hear the vibrancy of the city. I love just soaking it all in and my eyes are just always moving watching people with the hustle of the mopeds flying around with 2 people zig-zagging around. 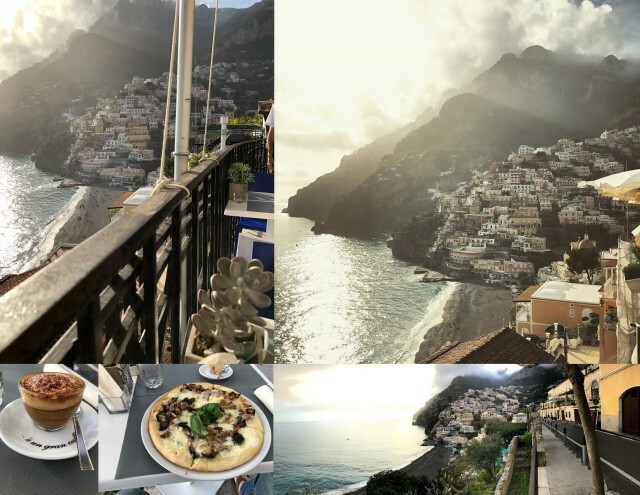 They say you have to have pizza in Naples since that’s where it was born… so found a little place and ordered two little ones to enjoy. After that headed back to the Hostel and had some beers with some people staying there. 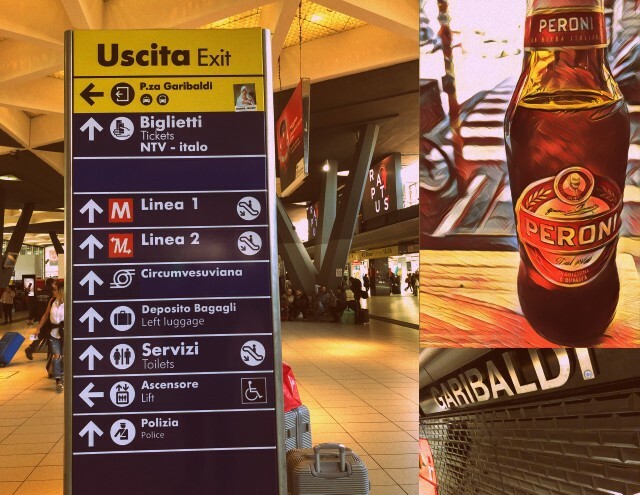 The next day… I would take a train heading to the Amalfi Coast and my work peep friend would make her way to Rome. Walking along the side of the road as cars zip past you was interesting since the roads are so narrow. 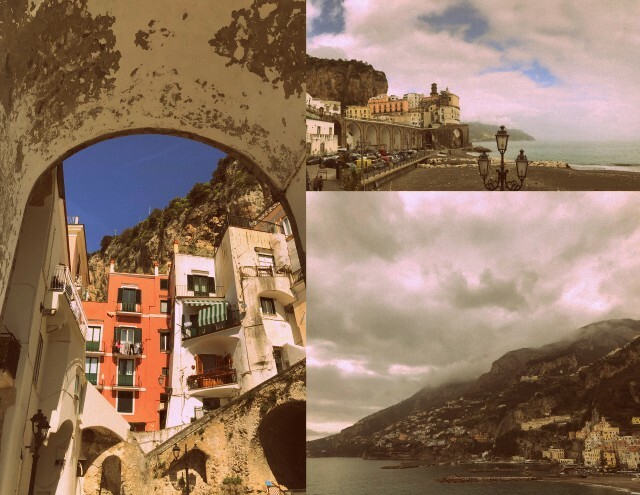 Walking to the town of Amalfi from Atrani is under 10min but you find yourself stopping and looking at the water and the hills rolling along the coastline. 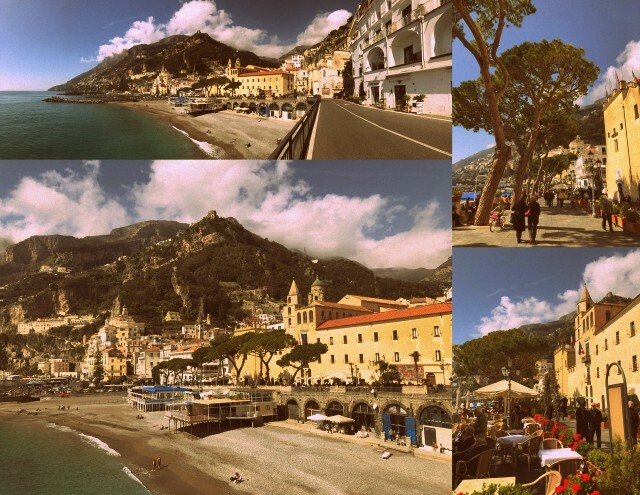 Amalfi is where you would take another Sita Bus to Positano and the small towns along the way for 2.40 euro’s. 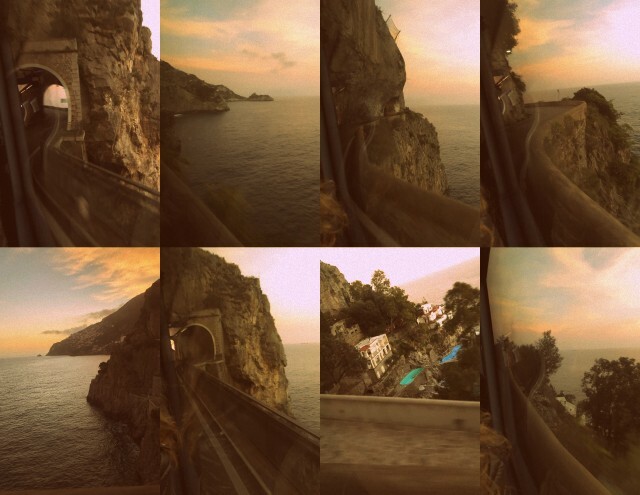 I loved the bus rides as you look at all the little houses and hotels stuck on the side of cliffs wondering if they ever will fall down and into the sea. I’m sure they have been there for about a 100 years and will continue to do so for another 100. As soon as you get off the bus you are just looking at all the little houses sitting on top of each other in the distance and everyone is snapping photos on their phone. 3 minutes getting off the bus I see some tables across the street from a little bar/restaurant. Why not sit and have a coffee and get something to nibble on and shoot some time-lapses and just listen to the “quiet” of waves and birds in the background playing in the wind as they float over the beach in the last rays of sunshine for the day. The sun will be setting soon. I didn’t venture down to the beach. I will save that for tomorrow. 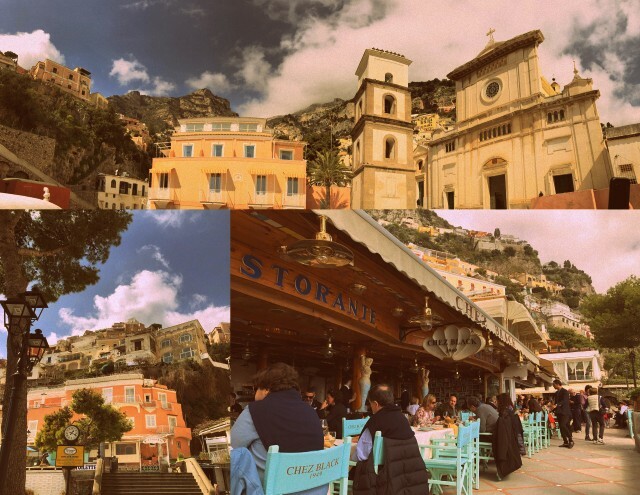 When I walked into Amalfi the bus was going to leave and there was spots along the water side… so I thought I would sneak into Positano a day early. 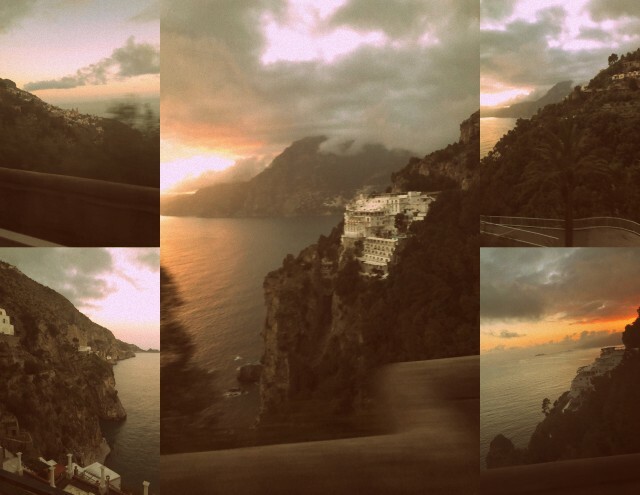 So I walked around the top part and took the bus back to then really visit the town of Amalfi. 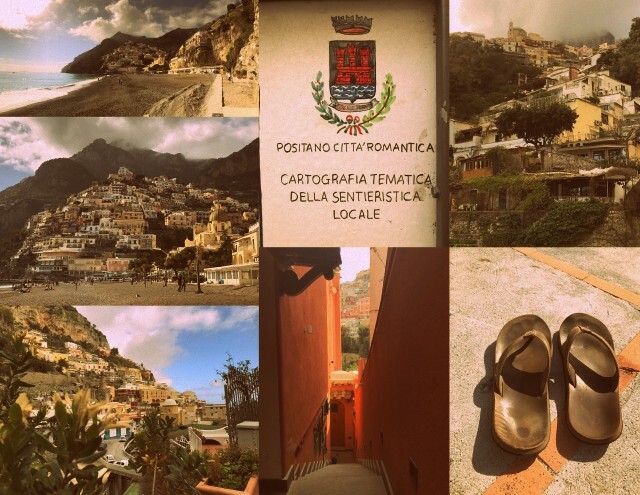 When I ventured back to Positano… I had to find my way down to the beach and just walked anything going down. 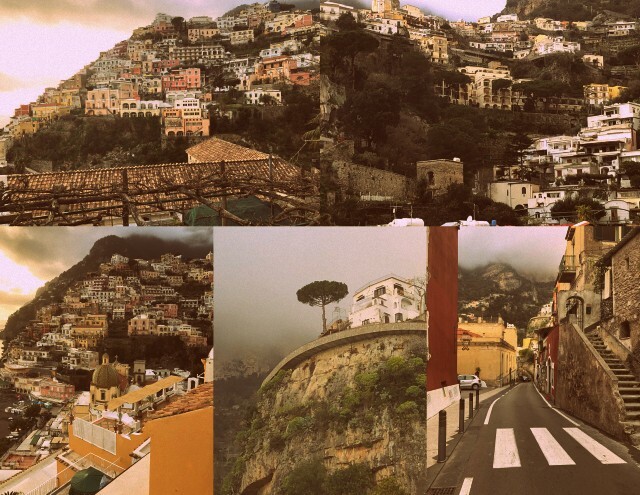 Every 40 feet you stop to look at the houses on the cliffside and there are lots of little shops to venture in and look. At the bottom along the water there are more shops and seaside patios to busy restaurants. I can’t imagine the amount of people there would be in the summer. Town of Amalfi at night below. Always people around and it was nice to wander around and snack on little things before walking back to Atrani along the road between the two towns. 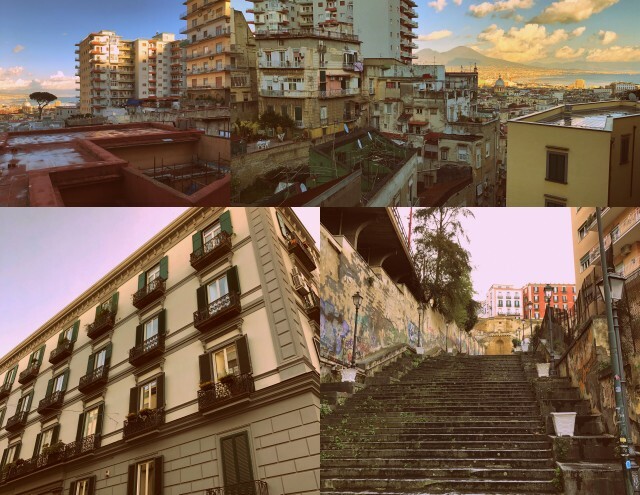 Checked out of my Hostel and took a early Sita bus back to Salerno where I would take a hour train to Naples to fly out. 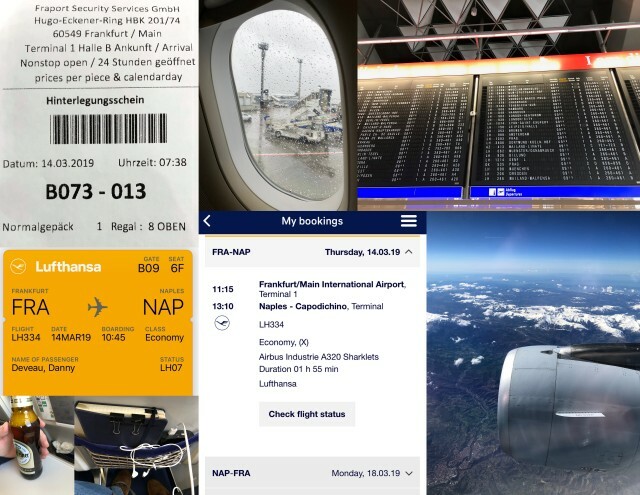 Since there is one flight at 11am from Naples to Frankfurt… I was scared and I decided to use NAP to Munich at 1pm and then the small 1 hour flight MUC FRA. We have 3 flights a day from NAP to Munich so there was another plane at 5ish as a backup. When I was at the conference I purchased tickets to fly to Italy and back to Frankfurt for next to nothing on my discount which is sweet. Flight to Frankfurt to Munich had a curved wing that you just stare at as you float in the air. I was sitting alone in the back with the flight attendants. Nobody sitting with me or on the other side which was nice. One flight attendant was so sweet. I kept looking at her. I stayed and talked to her after we landed and she told me she went to Halifax to look for houses to retire. Small world to think why would someone from Germany who goes everywhere think of Halifax. When we landed there was a plane with retro livery which was sweet. After getting off the plane it was a quick 3 stops on the train to the main train station downtown to check into my Hostel that is such a great place for crashing. 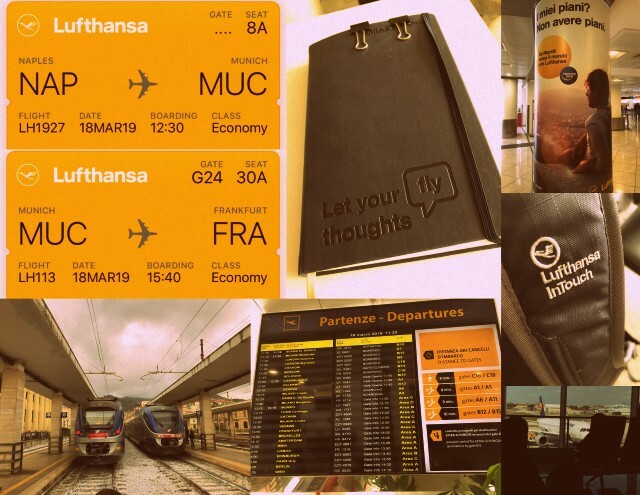 I would fly out the next day with LH. 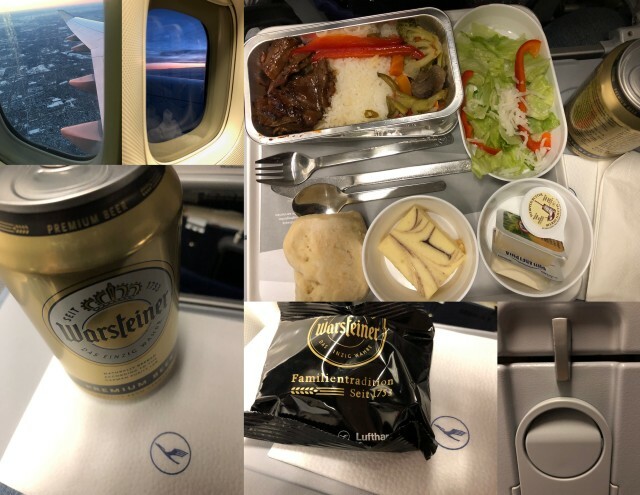 (but I didn’t… since my space on LH was removed somehow and I was booked on Air Canada at 5pm so I had the next day to take in Frankfurt a little more. Love maps where people put where they came from. The Hostel has a little bar and I had a bottle of red before retiring for the night. Beside it was a little poutine place so I had some pommies. The next day was a food truck festival outside the hostel so I had a little sample of that. They even had a wine truck as you can see below bottom left. Getting in line to board the plane in economy… I was first for my section. I followed the agent and she swiped my boarding pass and I heard a “beeeeep” and I thought… i’m not going to be on this flight or my seat has changed. I was scheduled for a window which I always want. She told me I was moved to 4D and I knew that was up at the front and not in the economy rows. 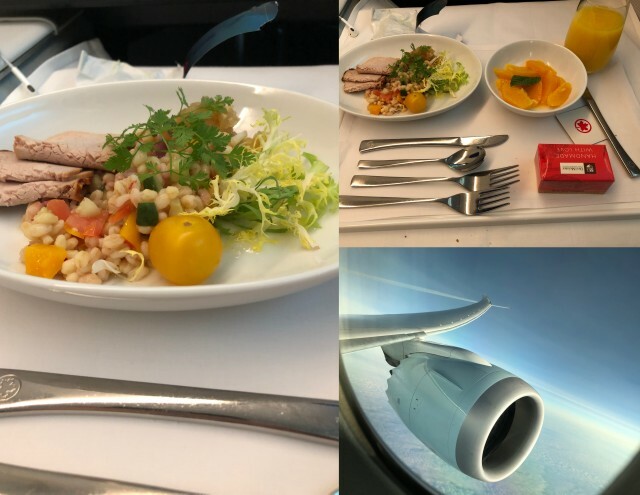 I asked her if I could change my seat and she helped me get a window and off I was down the tunnel heading to the plane with a business class boarding pass. 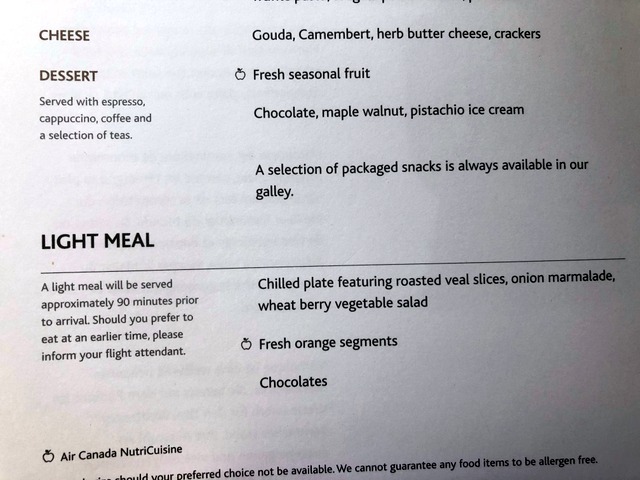 The cost to a passenger for that cabin for that direction is $2500-3500CAD. 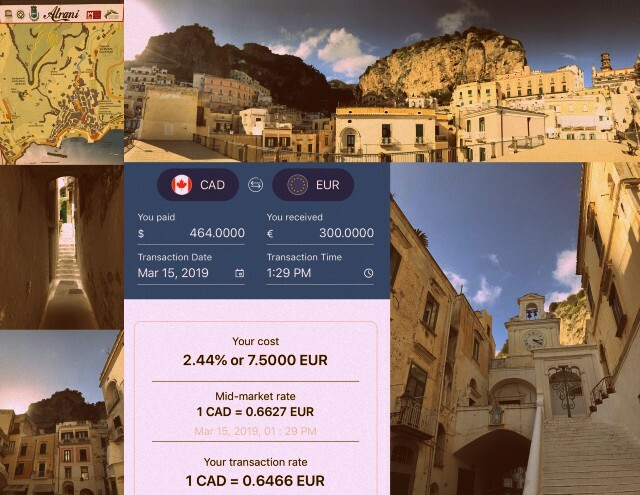 My Duty travel ticket was under $140CAD in economy. The Dreamliner is the worlds most advanced commercial jetliner that travels higher, faster and smoother. 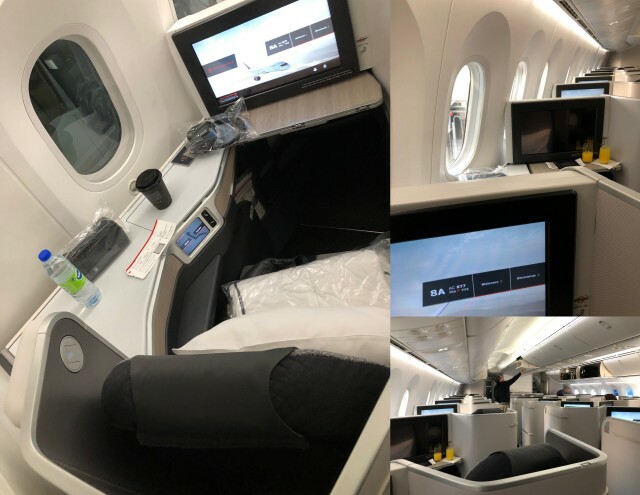 This has Air Canada’s newest business pods. With the window seats now facing the window. The windows on the Dreamliner are huge with no more plastic shade that slides down. Button controlled dimming that allows you 5 different settings. The staff can also control the cabin when it’s time to sleep and dim all the shades to darken the cabin. Noise canceling headphones are given to plug in. Seats have USB and plugs to power laptops. Touch screen remote for the inflight entertainment. Coming soon in flight messaging with other passengers if you are traveling with peeps. 18 inch screen with great quality for movies and television that remember where you are in the movie if you tap out to check the flight status of your trip. The table slides towards you and has two folds with locking positions. The drink menu is full of options. The amenity kit has the basic things you need or would expect to find. 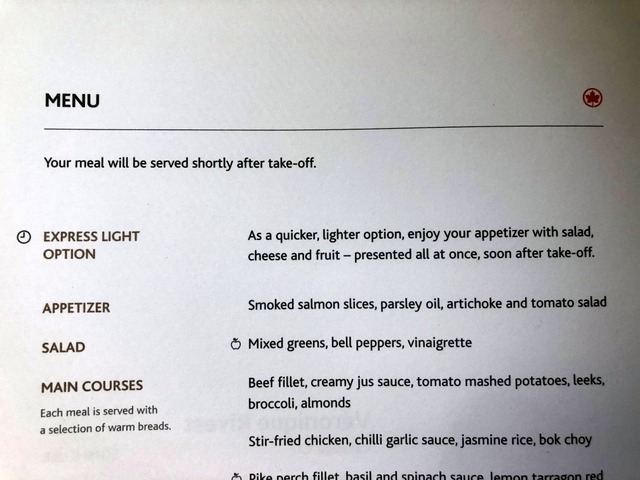 Hot towels are passed around before the dinner service starts with white linens for the dinner service and light meal before you land. Seats have built in massage option and you can control the firmness of the seat or mattress. Many different angles you can adjust your seat to relax, work, rest or watch the entertainment screen. Adjustable armrests that are extra wide. Full duvets, mattress and pillow are provided for resting. Washrooms are sensor and touch free. 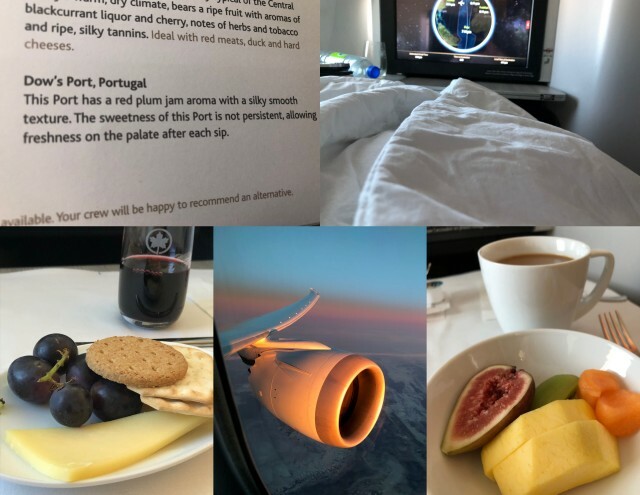 Throughout the flight there is a basket of chocolate bars and fruit if you want to help yourself to snack and throughout the flight the staff are always coming around offering drinks, juices and water. 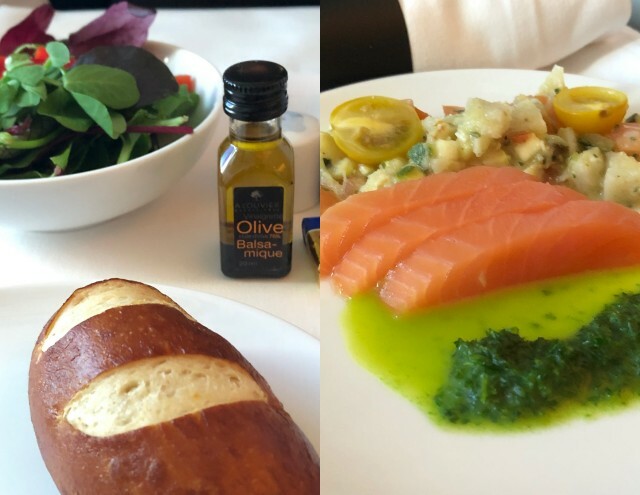 Before take off… I ordered my main dish and i just waited for the food trolley to roll up and see what the people in business class eat. Honestly… each portion was incredible. 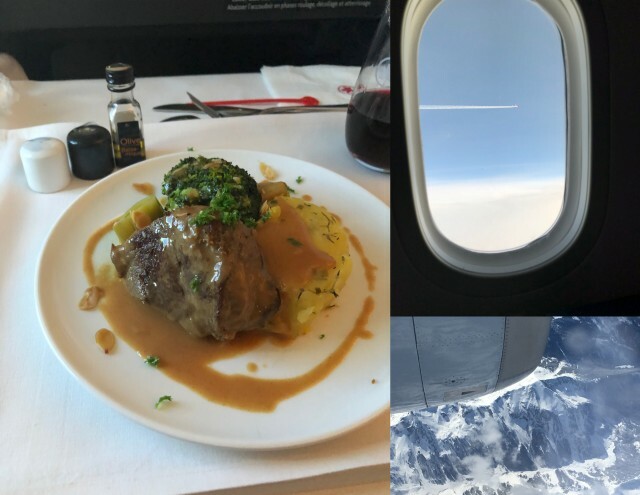 I was completely blown away and I felt like I was served in a exceptional restaurant and the food and service was top notch. After dinner and dessert… i didn’t want to sleep so I watched a movie and I did close my eyes with the lie flat bed for a hour to listen to a concert. I didn’t want to miss breakfast below to see what’s up with that. 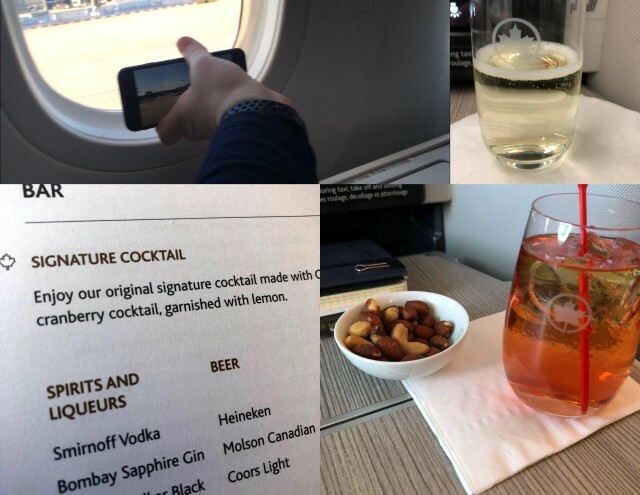 Vlog on the way home is below with my flight on Air Canada in Business Class. 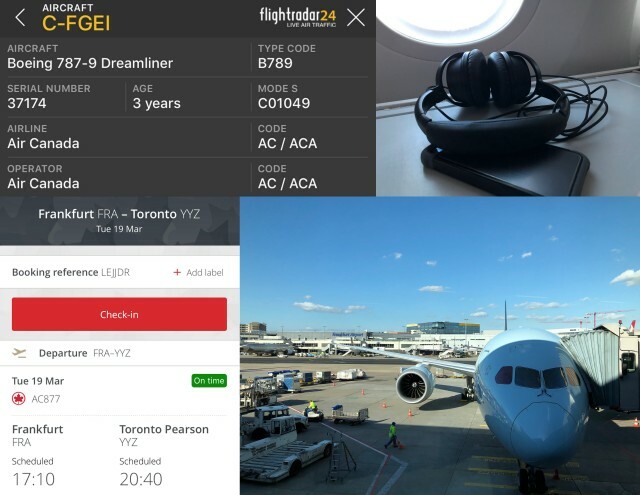 Truly incredible service and flight on the Dreamliner by Air Canada. Exceptional.